What Is The Best Pre-Season Football Program? What is the best pre-season football program? Our winners today have put together some great information and workout splits as you begin preparing for the fall football season. Check it out and see if it works! TOPIC: What Is The Best Pre-Season Football Program? You are a high school or college football player, and it is early June. Your first football team practice is in August, so if you are going to gain muscle, get faster, and get into great shape in order to dominate on the field, now is the time to really kick things into gear with your training and nutrition! What weight lifting program should you follow? 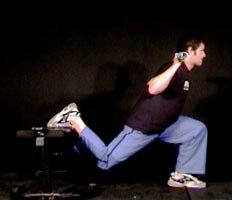 What type of cardio/speed/plyometrics program should you follow? What nutrition guidelines should you follow? What supplements should you take? Are there any special activities you should be doing right now to get the extra competitive advantage? Should your program change based on what position you are trying out for? For example, should your pre-season program change if you want to be a lineman, compared to being a wide receiver? Bonus Question: Who is one NFL player you admire for their great physical condition? Do you know anything about the type of training program that they follow or followed in the past? For most high schoolers, there's nothing better than walking onto a freshly cut field on a Friday right, dressed in pads from head to toe with your school's helmet on, ready for battle, ready for war. All football players dream of that game-saving sack, the tie-breaking field goal or the game-winning catch. Regardless of your goal or ambition, only two things matter in football, your determination, and your amount of EXPLOSIVENESS, regardless if your on offensive line, or defensive line - your explosiveness is what counts, how fast you get off that line, how fast you get down that field, how fast you go from a 3-point stance to blasting through that offensive line. A lot of people; no matter what you're going for, be it high school, college, semi-pro or even pro, dream of standing up on that field in front of hundreds or even thousands of people, but, before that happens, you got to get through summer training first. That's where I come in. The following program is designed for the average football player of every position, it specializes in strength, speed, power and explosiveness, something that EVERY position needs. First thing when designing a training routine, is to define your goal and then determine what best suits your goal. Well, football is a major contact sport that includes tons of explosiveness, power and speed. How is it possible to train all those in one training week you might ask? Well, it's not as hard as it looks. In a nut shell, you'll be doing an upper body/lower body split (I'll go more into reps and sets later). The split is designed accordingly. Notes: This is the way I trained when I played football, we had great strength training coaches. I personally added 100 pounds to my bench doing this program in a short term, about a year (of course, the bulk of that were 'noob' gains, being I started playing/training when I was a freshman in high school and my bench went from 90 pounds at the beginning of the year, to 190 pounds at the end of the year.). My squat increased GREATLY, My first squat max wasn't but 185 pounds, but by the end of my freshman year, I squatted 345. Of course, all my other lifts improved like crazy, but those are just a few of the ones that come to mind as a great achievement. What's a workout routine if you don't know what you're getting yourself into? Well, here is a list of the exercises you will be performing throughout your training. I'll get into this at a later time. Before starting this program, you should know your max on just about all those lifts mentioned above, this way, you can track your strength increases. Extra Stuff: A high pull squat is something my football coaches coined I believe, basically, you start out in high pull position, like you're doing a power clean, but have the bar start a few inches off the ground, and instead of dipping down just a bit when you jump, you dip down into a squat, catch the bar, then stand back up. 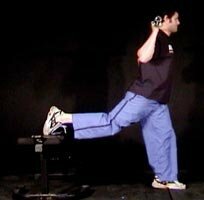 Skipping, yes, it may sound funny, but this will help with stretching of the major speed muscles and will get your body use to bringing up your legs, skip around a track a few times for a nice warm-up. Jump Ups: Do this 10 times per set, gradually going up in height for about 4 sets. 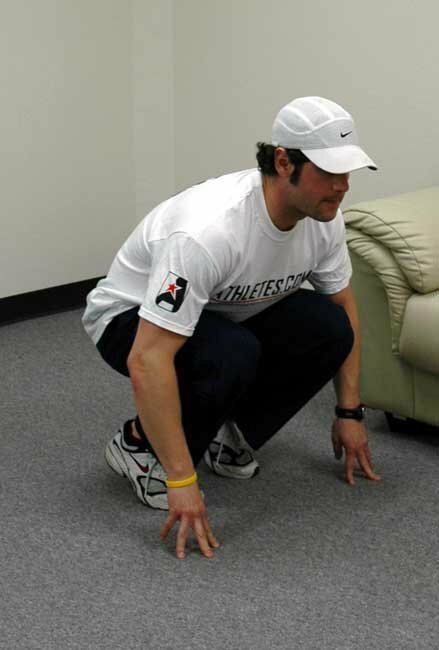 Frog Leaps: Do this about 20 yards, rest, then do it again 10 yards, rest, do it again for 5 yards. Click Image To Enlarge. Frog Leaps. 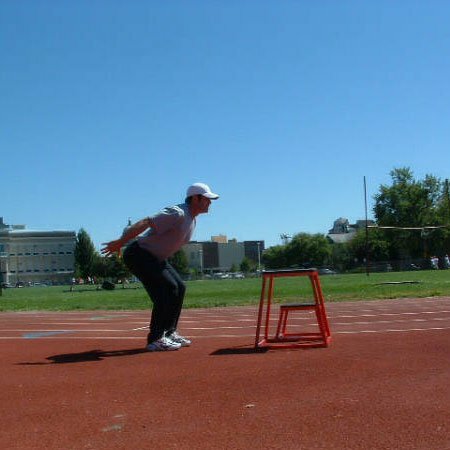 Sprinting: In my opinion, this is the best way to increase your speed and agility. Do five 20-yard sprints, four 30-yard sprints, three 40-yard sprints, two 50-yard sprints and then finally, set out a 40-yard dash, and sprint it at all out speed, take about a minute to catch your breath, get some water, and sprint back at full speed, do this until you are exhausted and can't go on. Bonus: Run through the woods. As weird as it may sound, our coaches used to take us out to a large woodland area on the weekends during camp and we would run through the woods, this helped increase our reflex speed (which is great for football), raw agility and moving at unexpected intervals (jumping, dodging, ducking, etc). Info: Make sure, if possible, to always have a spotter around. Also do appropriate warm-ups and appropriate stretching before and after. Make sure you stay hydrated, drink water before, during and after your workouts. On Wednesday, during springs, take about 1-2 minutes rest between each sprint, unless you require longer. As well, this routine is designed for explosiveness, so don't give up if you're not able to finish the workouts all the way through the first few times. Last but not least, push yourself, remember, your opponent is always working twice as hard! Of course, you must have your diet in check first, because supplements improve on your already great diet, so before you decide to supplement, make sure you have the perfect diet for your goals. If you are ready to supplement, there are 2 basic supplements that are a top priority for any athlete. I suggest and recommend ON's 100% Whey: Golden Standard. It's perfect with only 120 calories and 24 grams of protein per serving. It's also easily to stir/mix/or shake and goes down smooth! Good to take post workout for recovery, and between meals to keep your body a fresh source of constant protein for muscle rebuilding! This is a definite necessity, generally speaking, a multivitamin is a multivitamin, I for one, take Centrum: Pro. Though, if you're looking for something on the site, I recommend animal stack complete multivitamin, it was built with the athlete in mind! Now, if you have your 2 basics down, and you think your ready to move on to more advanced supplementation for your football needs. Creatine has been a world changing supplement, which offers great gains when used correctly, I for one, recommend bulk creatine monohydrate, specifically, Higher Power 1000 grams Creatine. This will give you that extra "umph" you need right after a good workout/practice and it will definitely put size and mass (along with strength) on you. These are a pinnacle in recovery, BCAA stands for branched chain amino acids, there the building blocks for protein (amino acids in general) and it will give you more of the essential amino's (leucine, isoleucine, and valine). BCAA's are good year-round figuratively speaking; you can take it in the morning, during a workout, after a workout, whenever just about depending on how sore you feel, this little supplement will knock days off of your recovery time! Try to consume 1.5-2 grams of protein per body weight pound. Make sure you start the day with a power breakfast (good amount of protein and carbs, I recommend 5 egg whites and a cup of oats). Also, make sure you get PLENTY of casein protein before bed, some great sources are: skim milk, cottage cheese, etc. Of course, you should check with a doctor before trying any fitness program. Also, every 8 weeks, take 1-2 weeks off for resting as you see fit to give the body more time to heal-up, it's a taxing program. Well, that's it for Super Man's training routine, I guarantee fast results with this program in strength, speed, power and explosiveness. You can rest assured you'll make first string following this program. Let's just hope your opponents don't get a look at this. I played High-School football. I was J.V. my first few weeks during my freshman year, but they saw the greatness and potential in me and moved me up to Varsity before I graduated my freshman year (of course I was bench warming, I didn't get much play time, but I have TONS of experience). I played linebacker/defensive line, even though they ended up moving me to running back. So I've had experience on both sides of the field. I would have played college, maybe even pro, but I messed both my knees up really bad playing this beautiful game my senior year (both my knees dislocated, now it's a reoccurring thing). I totally give all my respect to any true offensive linemen out there. Not just one, but all of them. Those guys bust their guts to protect that quarterback, running back, etc. and they also hardly ever get credit. Whenever I got interviewed, I always shouted out to the offensive line of my team for all their hard work and dedication, without them, a win is not possible. Band Resisted Inversion/Band Resisted Eversion. 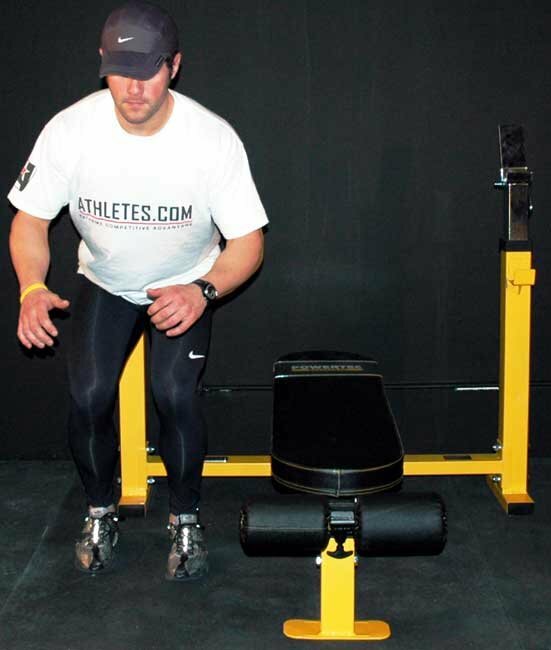 Step Up Jumps - Find a bench about 18-24 inches high and place one leg on the bench with one leg on the ground. 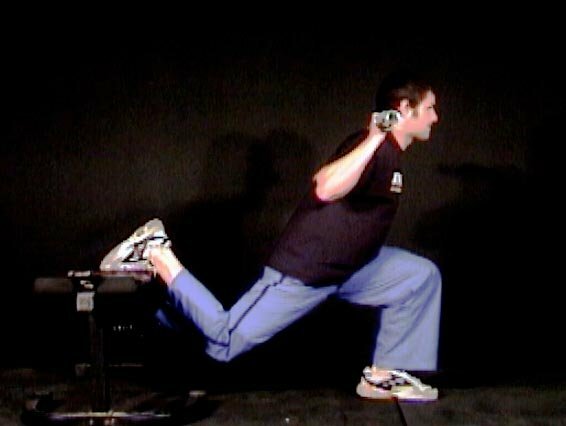 Now, from a dead stop and without bending down at all, jump as high as possible and land in the exact same position with the same leg on the bench and the same leg on the ground. Pause for a second and repeat. 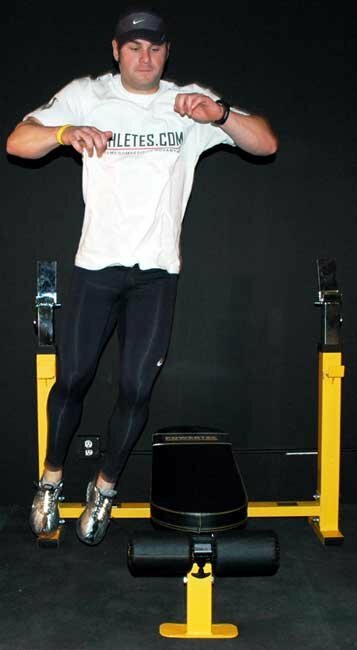 Broad Jumps - Stand in a stationary position and jump up and forward as far as you can. Pause and re-set yourself and perform the required number of repetitions. 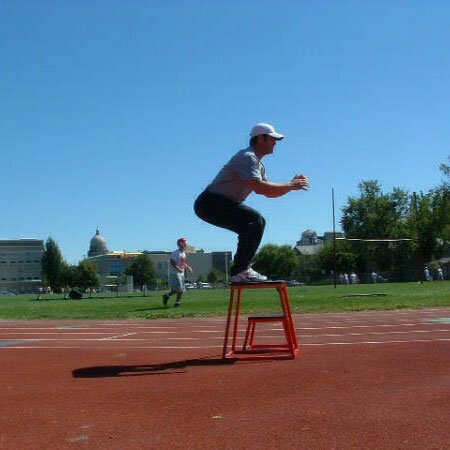 On-Box Jumps - From the ground simply jump onto a box or bench and then step off. 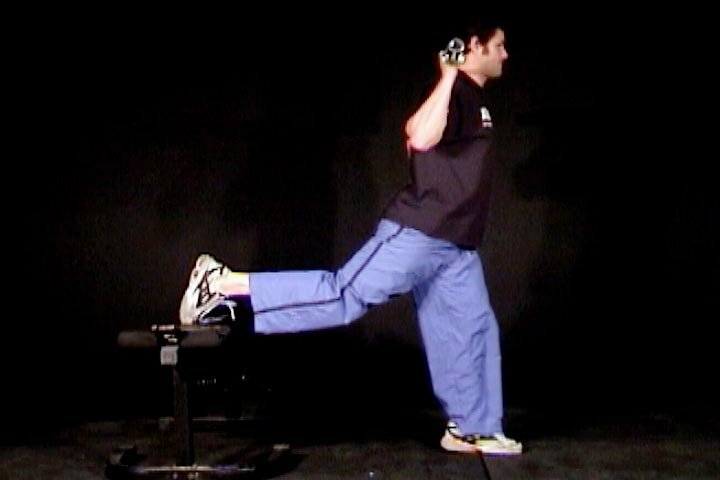 DB Toe Raises - Reverse calf raises in which you lift your toes against a resistance, i.e. a dumbbell. Band Resisted Inversion/Eversion - Take a resistance band and tie it against a stationary object and attach the other end to your foot. Push your foot in/out against the resistance. The two months prior to training camp are for gaining mass. 6-8 meals per day and 1.0-1.5 gallons of water daily will suffice. In order to grow, you must have a caloric surplus, that is, you must consume more calories than you expend. As a general rule of thumb, eating 500 more calories than you expend will help you gain approximately 1 lb of bodyweight per week. Eating 1000 more calories than you expend every day will make you gain about 2 lbs of bodyweight per week. Any more weight gain than that and you are looking at a disadvantageous muscle to fat gain ratio. The often forgotten variable to a balanced diet is healthy fat. Concentrate on eating enough flax seed oil, fish oils, and nuts such as almonds. The staple supplement that every bodybuilder probably takes already. There is no real need to even explain the multitude of benefits Whey offers, such as increased recovery and more muscle growth while preventing catabolism (Muscle wasting) and promoting anabolism (Muscle growth). CEE is a new form of creatine that is really a lot more effective that creatine monohydrate because the absorption is so much better and it is much more powerful; Taking one serving pre-workout and one serving post-workout aids in recovery and adds strength and size. View Top Selling CEE Products Here. No explanation needed here, the first thing you should do when purchasing supplements is get a quality multivitamin because it will help you meet your daily needs for various vitamins and minerals. BCAA's assist greatly in recovery which will help you to train longer and harder. Mega dosing has been shown to give even greater results. Try to play football 1-2 times per week, preferably on your off days - Wednesday and Sunday. This should be tackle football if possible so as to simulate the game of football as closely as possible. Most definitely. The physical requirements for different positions in football vary greatly. For example, a wide receiver does not need to train to "hit hard" while a lineman should. 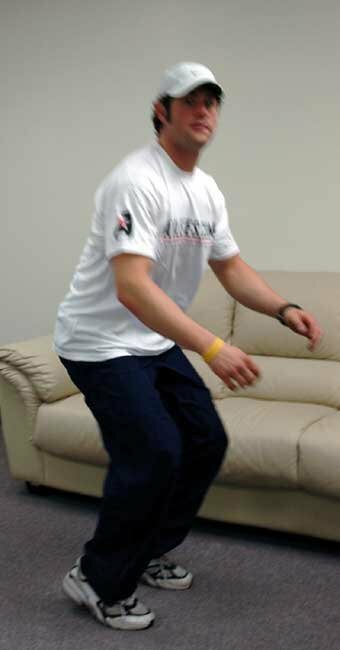 Conversely, a wide receiver should train for quickness and agility while this would not be a primary focus in a lineman's training regimen. No, I have never played organized football in my life. Who is one NFL player that you admire for their great physical condition? Do you know anything about the type of training program that they follow or followed in the past? I admire Tiki Barber's work ethic and physical condition greatly. After reading about his workouts on the Sports Illustrated web site, I was amazed at his physical condition, brute strength, and knowledge about weight training. According to the Website, Tiki can leg press 950 for reps, squat 750, and do stiff-legged deadlifts with 405 for reps. This is the program he followed after training with Joe Carini, a former competitive powerlifter in New Jersey. Author paid some respect to format of outline. Spelling errors. Not enough content for an article. Comments: A good conversational style and command of the subject were marred by a general disregard for conventions of spelling and grammar. More content is needed for an article. This competitor is encouraged to read articles on Bodybuilding.com and past winning submissions for topic of the week. Good effort. Nice cadence and storytelling style. Some correctable structure errors. Needed a bit more content. Comments: Opening paragraph changed gears three of four times. This would have been more readable as a group of paragraphs. While the work showed some respect for the outline, more depth is needed. Writing a paragraph or two about why a routine is set up the way it is can provide more content. Writing is like any other endeavor. First time out you don't always take the Superbowl ring. Persistence and striving for improvement will yield results like anything else. Nice job on the workout and nutrition. Weak paragraph structure. Some grammar errors. Not enough content. Did not conform to outline. Comments: When writing an article, one of the hardest and most important tasks is outlining the work. Topic Of The Week does this for you with the question(s) of the week. Take full advantage of this for best results. This is a great opportunity to sharpen your wordcraft, share knowledge and GET FREE SUPPLEMENTS! You also develop a skill that you can use when father time takes you off the field. The opening sentence would have been stronger as two sentences. The last two paragraphs are a reader's nightmare. Check out: http://www.bartleby.com/141/ for the basic guidelines on writing. (sott's press for your writing muscles). It bears repeating, keep at it. Just like football, there are few naturals. Most have to work at writing to gain any level of competence.